Football season is here! As training camp opens today, I’m reminded of the many traditions of the Green Bay Packers faithful. Whether it’s railbirding it up at Ray Nitschke Field or having your favorite Packer take a spin on your 10-speed bike, there’s nothing quite like the start of another NFL year in Titletown. For me, training camp is a tradition that’s literally been handed down from one generation to the next. Some of my first experiences as a Packers fan were watching practice with my dad and grandfather. I can still feel the impressions of the chain-link fence on my arms as dad and I watched Don Majkowski toss the pigskin. I can also vividly remember trying to get Reggie White’s autograph. The towering 92 with a flock of kids around him. What else could I do but hold out my arm, stand on my tip toes, and hope he’d scribble his name. While I didn’t get the Minister of Defense’s signature, the tradition became cemented in my heart. After all, part of the fun of training camp is getting up close with your favorite player. Could this year be the year that Aaron Rodgers rides my bike? I’m probably a little too old for that, but it would still be totally awesome. Training camp hasn’t always been the experience it is today. My dad and grandfather will tell you that. This past weekend, my dad shared his autograph book from 1968 with me. This was the beginning of a new regime in Green Bay. Phil Bengtson was taking over the team from Vince Lombardi after the Pack defeated the Raiders 33-14 in Super Bowl II. 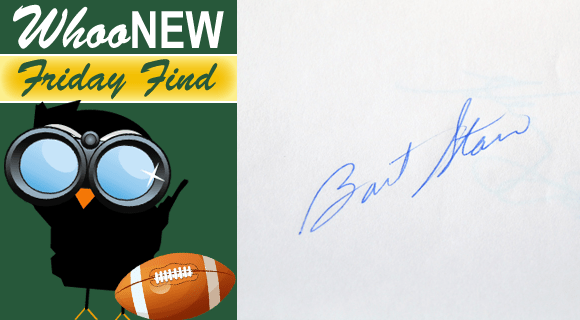 It was during this training camp and in a matter of hours that my dad, Robert Bruss, filled his autograph book with an impressive collection of signatures which include Bart Starr, Dave Robinson, Willie Wood, and dozens more. Most football fans would say the names in this autograph book are legendary. There are countless hall of famers in it, and some that should definitely be there (Jerry Kramer). And while the ’68 season was anything but legendary (the team posted a 6-7-1 record and had its first losing season since 1958), it remains a memorable one every time I flip through my father’s autograph book. As I reminisce on seasons past, I’m also looking forward to creating new memories. Perhaps I’ll be able to drag my wife to a practice. Would it really be so wrong to tell her that Clay Matthews practices shirtless? Whatever the season has in store for the green and gold, I’ll be sure to follow it every step of the way. I hope you do, too. Also, WhooNEW would love for you to share your favorite training camp story in the comment section below. After all, part of being a Packers fan is sharing the tradition! Thanks for sharing Muffy! That’s a pretty cool story.